Americans remain largely ambivalent to the tectonic shifts taking place in Egypt, Jordan, Albania, Lebanon and Tunisia. What’s worse is that most Americans 40 years and under have an oh-hum view about their own government employees (soldiers, diplomats), and contractors, who are fighting and dying in Afghanistan and Iraq. Do they know that US Special Forces engage in Foreign Internal Defense operations in 65 countries around the globe supporting “friendly governments” like Egypt, Jordan, Thailand, Iraq and Israel through training and, if necessary, combat support? 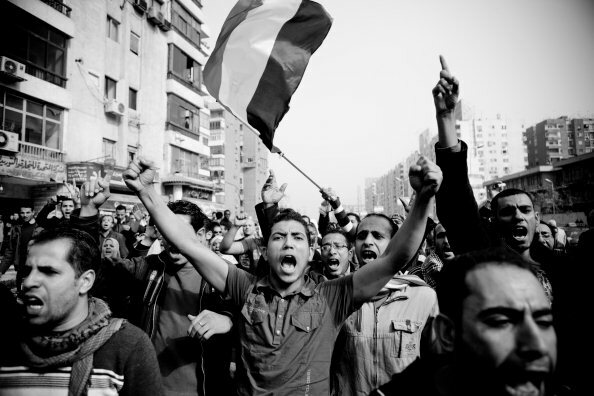 Pew Research reports that only 11 percent of the American public is following the historic people movement in Egypt. Don’t the Egyptian people deserve the same support from Americans given to the Iranian Green movement in 2009? Given the indifference of the American public, it is no surprise that it’s political, military and business leaders—and academia in think tanks and universities—remain blind and unprepared for game changing street movements taking place in the most heavily armed region of the world, the Middle East/Central Asia. The USA lacks agility in policy making and execution. More’s the pity; it lives still in the Cold War era longing for the grand enemy and having to settle for impoverished insurgents/terrorists. Yet the governing and policy setting elite in the USA are simply reflections of the apathetic will of the American people. Yes, “stunningly ignorant”. The US Congress has become a loony bin with the arrival of the Tea Party, and the Oval Office hosts a President who, looking caring and liberal on paper and in the virtual world, has continued and even accelerated the Reagan–Bush I–Clinton–Bush II 80/20 program: 80 percent of the wealth is to be owned by 20 percent of the people. That process continues as more Americans (human capital) are written off the books. The ranks of the American unemployed, homeless, benefitless, and temporary work force continues to swell. It also includes many formers members of the US military. In the face of all this, the US Congress finds it difficult to extend unemployment benefits but, with Presidential support, approves a trillion dollars to salvage banks and financial houses. Yet, American consumers are called upon by leaders to borrow and spend to stimulate the economy. Perhaps a better plan would have been to have the US government pay off all the mortgages of American homeowners and buy out other consumer debt. And the USA continues its slide into some sort of military-capitalist-democracy as the eloquent Andrew Bacevich has pointed out. There is an important lesson from Egypt here: as the Egyptian Army maintains an environment where protesters can demonstrate without reprisal, they are showered with praise by commentators and government officials alike. Images of lovey-dovey military members and civilians in solidarity are all over the Net. But make no mistake; the armed forces are employees of the government and their interests are quite clear: If not overly, then covertly retain power and position. Angels do not sit in the turrets of Abrams tanks. As the writers at the ever observant World Socialists recently stated, the USA clearly has interests many government and business officials, pundits and commentators do not want to discuss. Life, liberty and the pursuit of happiness for the Egyptian people is not first among those interests. “The policy being developed in Washington has, in the short term, two aims: to shore up the Egyptian military and intelligence apparatus—hence the appointment of intelligence chief and former general Omar Suleiman as vice president—and to prepare a political alternative to Mubarak if his removal proves necessary. But any replacement sanctioned by Washington will be nothing more than a puppet providing pseudo-democratic window dressing for a new military regime. As the Obama administration confronts a growing revolutionary movement in Egypt, its tactics will flow from two overriding and inseparable strategic aims: defending the Egyptian capitalist state and maintaining the country as the linchpin of American imperialist operations in the Mediterranean, North Africa and throughout the Middle East. The working class in Egypt and its allies among the insurgent masses must not permit themselves the slightest illusions in the intentions and plans of President Obama. The president and his advisors in the Pentagon and the CIA are determined to contain…the revolutionary movement. Leaders in every nation are now watching their backs as well they should. But the masses, the people, are ultimately responsible for whom they choose for figureheads/leaders. Concrete change that alters the course of a nation must come from The Street. It is there where 80 percent of the people work their lives away for the 20 percent who rule–whether through the voting process or brutal oppression. The Egyptian people have shown that the Net and Globalization can be used for more than fun and games. As the Egyptian government shut down the Net and other communications channels to disrupt protesters, it was engaged in a cut-off-the nose to spite-the-face policy. For example, millions of dollars in lost business revenue for telecommunications companies has taken place. The ripple effect must be enormous. The Net and Globalization have given people everywhere the ability to see past the statements/data of their governments and corporations. Wikileaks Cables, of course, confirmed that there are methods and madness in a diplomatic corps, intelligence agency, contractor or military service. Thanks to the Net and Globalization, leaders everywhere may well yet be held to account in a timely manner. The Egyptian protesters (and to a degree the Wikileaks case) have shown that it is possible to create a Global Virtual Mass Movement in support of a political/labor cause. Al Jazeera, Facebook, Twitter, TOR and Anonymous and a host of hackers, computer technicians, et al, have, from a distance, accelerated the demise of Mubarak’s government. The day should be near when the disenfranchised in one country can call on the publics of many countries to protest/strike against governments and industry in virtual and physical space. A Global Mass Movement, or strike, is just around the corner that will bankrupt a corporation or weaken another government. This is so true it would be laughable if there weren’t so much at stake. I’m still trying to wrap my head around Obama’s invocation of “our” Sputnik moment, possible the most ridiculous moment of his presidency – did he really believe that millions of un- and under-employed Americans were going to buy that idiotic line? Brzezinski’s comments about geopolitical ignorance among the public are instructive, but this is about plain old zeitgeist, and he got it badly wrong. I can only imagine the comment was meant to shore up his anticommie credentials with the Teabaggers, but I don’t think that’s really paramount to their concerns. The red-scaring of Obama, much like the strategy of the birthers, is in large part an end-run around the overt racism they can’t get away with – if they can’t dehumanise him, they’ll de-Americanise him, which is one and the same for some. I’m gobsmacked that he rose to the red herring with the Sputnik thing. I totally agree with this sentiment, I use the term “Interactivism”; Interactive/Internet Activism. It’s a phenomenon that we will keep seeing as long as people are not satisfied with the system they inhabit. As long as tyrannical dictators establish regimes based on oppression of the people and strict control of dissent online, there will be a global social support network on the internet for them to use.